Earlier this week, Bev Bevan published a quartet of photos on his official Facebook page showing the ELO co-founder looking pleased as punch with his RRHOF award (having sadly missed the induction ceremony at The Brooklyn Center in NYC on Friday 7th April) meaning that Bev, Roy Wood (via Twitter) and Jeff Lynne have all now been snapped with their RRHOF statues with the absent Richard Tandy the only remaining ELO inductee not pictured in possession of his award to date. Yours Truly KJS and elobeatlesforever (elobf) wish Richard all the very best and look forward to his return to the Jeff Lynne's ELO line-up for their Summer stadium dates in Sheffield, London, Glasgow and Hull. 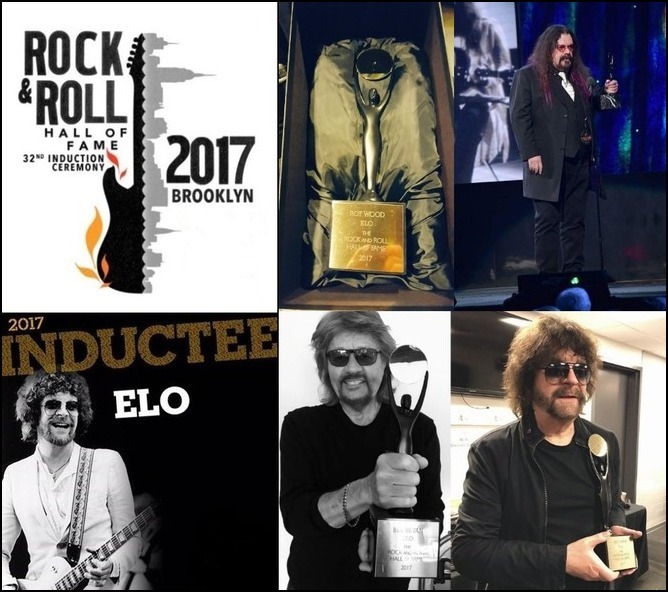 And - if RT just happens to read this elobf article - please consider letting the fans also see you proudly holding your RRHOF gong too for an ELO Rock & Roll Hall of Fame full house! Has Roy Wood done a post Hall Of Fame interview, where he talks about it all and gives his thoughts? I'd be interested in reading it. Still no news on Richard Tandy?